Increasing Life Expectancy Visualized as an Advancing Wave of Late Life Mortality Risk – Fight Aging! 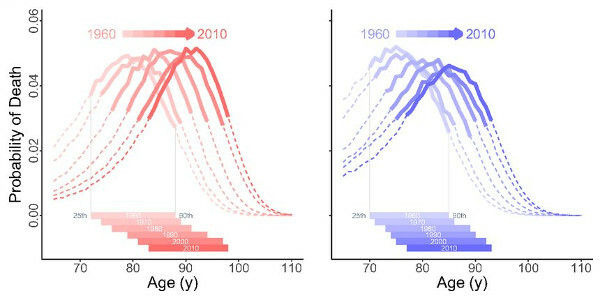 Today's open access paper provides an interesting visualization of the slow upward trend in life expectancy that has taken place over the last 60 years. A plot of the distribution of human mortality by age over the last third of life results in a wave-like curve, peaking at around 90 years of age. But those are today's numbers. In the 1960s, the curve had much the same shape, but the peak was at 80 years of age. Life was shorter, but the distribution of mortality at the end of life was much the same. This is the case despite large changes in the causes of death over this span of decades. Mortality risk due to heart disease has diminished greatly, for example, thanks to the advent of statins and similar treatments. The slow march of medicine - meaning control of infection and improved health throughout life, not just incrementally better ways to treat age-related disease - has resulted in life expectancy at birth increasing by two years every decade. Remaining life expectancy at 65 has increased by about a year with every passing decade. These trends are now a matter of history, and will not continue as they have. The advent of senolytic therapies to selectively remove senescent cells, one of the causes of aging, will cause an upward leap in life expectancy at 65. Other rejuvenation therapies that arrive in the decades ahead will result in further gains. The era of slow, incidental increases in life span is over. The era of deliberately engineered longevity has started, but it will most likely take two decades or more for the results of present clinical development to start to appear in population-wide demographic data. There is a lot of work left to accomplished not just in development but also for distribution of rejuvenation therapies: senolytics already exist, but next to no-one is using them, for example. This must change. We conclude that an advancing old-age front characterizes old-age human survival in 20 developed countries. The long-term speed of the advancing front is ≃0.12 year per calendar year, about 3 years per human generation. The location of the survival front is the 25th percentile of mortality. Thus, the front implies that, e.g., age 68 years today is equivalent, in terms of mortality, to age 65 years a generation ago. Our findings echo aspects of an earlier proposal that mortality hazards have, over the years, shifted rigidly to older ages. Our analysis of percentiles makes no assumptions about the pattern of mortality at young or old ages and focuses on older deaths. However, our finding of a shifting front in the percentiles of death at old age is consistent with some patterns of shifts in old-age mortality hazards. Our findings provide no support for an impending limit to human lifespan, certainly not at an age that affects the movement of the survival front (between the 25th and 90th percentiles). To the extent that we can rely on the long-term speeds of percentiles above the 90th, the oldest deaths are being compressed in some countries but definitely not in others. Here again we find no support for an approaching limit to human lifespan. Nor do our results suggest that endowments, biological or other, are a principal determinant of old-age survival. The advancing survival front that we find suggests that the effects of inequality on mortality may be much smaller among old-aged adults than among younger adults. Our analyses use period life tables, not cohorts, and suggest that continued mortality improvement depends largely on period processes such as economic growth, investment and advances in health science research and practice, and increases in the age of transition to disability. Our results also constrain biological arguments about the causes of death, especially the plasticity of death rates in response to environmental factors. Our moving survival front is consistent with a plateau in mortality rates, but implies that the location and possibly the level of the plateau change over time. @Reason: This was a real enhancement to the wall of text. "Our findings provide no support for an impending limit to human lifespan, certainly not at an age that affects the movement of the survival front"
Interesting. Olshansky used the same front to conclude that we are approaching the limit of human lifespan. Now, if I do a naïve extrapolation of human life expectancy and use the same rate of expansion of 0.12 per calendar year, would mean than in 100 years at the same rate of improvement, the life expectancy would be 12 years more. If I start playing with the numbers it turns out that for a lifespan of 80 years the life expectancy (at birth) will grow by 9.6 years (all else being equal). If we assume with the sleight of hand that the increase is not absolute but rather relative to the lifespan. So if the current life expectancy is 80 years and the annual increase is .12 y, then for a life expectancy of 100 it would be 0.15 one (1/666 or one to the number of the beast :) so with the continuous improvements at the life expectancy of 666.7 the gains would be more than a year per year or kinda reaching the LEV, if it can be applied to late life. Of course getting there would take several millennia at this rate of change. And when the life expectancy is over a thousand years, we can start slowly colonizing the nearby stars. I'm seriously considering trying senolytics even though I am in my late 30s. The thought of those senescent cells accelerating other types of damage isn't pleasant. Late 30s is almost forty. You might get some visible benefits. And as long as you sick duo quercétin and fisetin , it should not be dangerous. The steering stuff like navitoclax and dasatinib might be harmful.